1.1. Seller shall mean SIA Osterode, company No40003717857, VAT NoLV 40003717857, domicile address/correspondence address: Ieriku iela 3, LV-1084 Riga, Latvia. 1.2. Samsonite.lv shall mean the online shop at www.samsonite.lv. 1.3. Buyer shall mean one of the following: (1) a legally capable adult; or (2) an underage person between 14 and 18 years of age bearing the consent of their parents; or (3) an emancipated underage person; or (4) a legal entity. 1.4. Parties shall mean the Buyer and the Seller jointly. 1.5. Personal Data shall mean any information relating to a person (the subject of the data) whose identity is known or who can be directly or indirectly identified on the basis of data such as a personal ID No, and so on. 1.6. Personal Data Handler shall mean SIA Osterode. 1.7. Terms and Conditions shall mean the present Terms and Conditions of Online Purchases and Sales at www.samsonite.lv. 1.8. Account shall mean the product of the Buyer registering at Samsonite.lv, resulting in the creation of an account where personal data of the Buyer and order history shall be kept. 1.9. Merchandise shall mean everything available on sale at Samsonite.lv: suitcases, handbags, backpacks, wallets, accessories. For the purposes of these Terms and Conditions, the term ‘merchandise’ shall mean both singular and plural. 1.10. Purchase and Sale Agreement shall mean a Purchase and Sale Agreement between the Buyer and the Seller constituting the application for a Merchandise order presented by the Buyer to the Seller at Samsonite.lv, and the Terms and Conditions of Purchases and Sales as later amended and modified. 2.1. The present Terms and Conditions shall be a binding legal document for the Parties, outlining their rights and duties, the terms and conditions of purchasing and payment for the Merchandise, the manner of deliveries and returns of Merchandise, as well as other terms and conditions relating to purchases and sales of Merchandise at Samsonite.lv. 2.2. 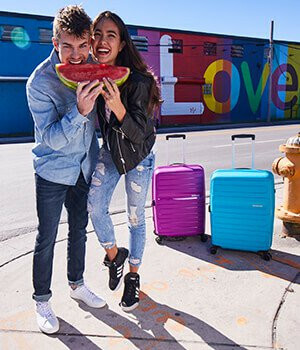 The Seller shall reserve the right to modify, supplement, or alter these Terms and Conditions at any time and it is binding when Buyer purchase Merchandise on www.samsonite.lv. The new wording of the Terms and Conditions shall become effective when published at Samsonite.lv. Buyers may access the latest wording of the Terms and Conditions on the Samsonite.lv website, it shall be presented for them to read every time they purchase Merchandise. 2.3. Registration may be done and Merchandise purchased by persons and entities specified in paragraph 1.3 hereof subject to confirmation of having read the Terms and Conditions (paragraph 2.4 hereof). By confirming having read the Terms and Conditions, Buyers shall also acknowledge that they have a right to purchase Merchandise at Samsonite.lv and match the definition of the ‘Buyer’ contained herein. 2.4. The Buyer shall acknowledge having read and agreeing to follow these Terms and Conditions by ticking the declaration: ‘I have read the terms and conditions of online purchases and sales of Merchandise at Samsonite.lv and AGREE TO FOLLOW THEM.’ The Buyer shall have a possibility to agree or disagree with the declaration stated in this paragraph of the Terms and Conditions by filling out the form ‘New Client Registration’ at the time of registering at Samsonite.lv, and every time they place a purchase order for Merchandise. 2.5. If the Seller has a right or duty to provide information or documents to the Buyer by e-mail, the Buyer shall be responsible for presenting to the Seller the Buyer’s valid e-mail address at all times. In the event of the Buyer’s failure to update their details appropriately, the Seller shall not be responsible for any losses the Buyer may suffer as a result of it being impossible to contact them. 3.1. Both registered and non-registered users shall be able to make purchases at Samsonite.lv. 3.2. A Purchase and Sale Agreement between the Buyer and the Seller shall be deemed made when the Buyer performs the following actions at the shop: (i) creates a basket of Merchandise following instructions from the Seller; (ii) specifies Merchandise delivery information; (iii) chooses a method of payment (and makes an advance payment if so required); and (iv) the Seller confirms the Buyer’s order by displaying and/or sending a notice of confirmation. The Purchase and Sale Agreement shall be deemed duly executed when the Merchandise are handed over to the Buyer in the manner prescribed by the legislation and herein. 3.3. Buyer orders shall be logged and stored in the database of the Samsonite.lv online shop for a maximum period of 2 (two) years, starting with the termination of the last purchase and sale relationship. In the event the Seller believes it necessary (for instance, for the purposes of the Seller’s bookkeeping and/or other legitimate business-related objectives of the Seller), Buyer orders or even a specific order from a single Buyer may be stored in the database of the Samsonite.lv online shop for a longer period of time. 4.1. The Buyer shall have the right to purchase Merchandise from Samsonite.lv in the manner outlined herein. 4.2. The Buyer shall have the right to cancel their orders in the manner outlined herein. 4.3. The Buyer shall have the right to exchange or return Merchandise in the manner outlined herein. 5.1. The Seller shall have the right to alter, suspend, or terminate certain functionalities of Samsonite.lv, either in part or in full, as well as alter the placement of elements at Samsonite.lv. 5.2. The Seller shall have the right to suspend or terminate the activity of Samsonite.lv. In that event, all Buyer orders that have been accepted and confirmed shall be completed, and no new orders shall be accepted. 5.3. The Seller shall have the right to cancel a Buyer order on the terms and in the manner stipulated in paragraph 10 hereof. 5.4. When the Buyer chooses the method of delivery specified in paragraph 10.4 hereof, the Seller, in the event of any uncertainty regarding the information given in the order, shall have the right to contact the Buyer using the details available in the order. The Seller shall not be responsible for any delay or failure in executing an order if it was unable to contact the Buyer using the contact information provided by them. 5.5. The Seller may conduct various marketing events and, granted previous consent from the Buyers, notify them of such events using the contact information provided by the Buyers. The Seller shall also have the right to alter the terms and conditions of the marketing events in question or terminate any ongoing events unilaterally and without further notice. 5.6. The Seller shall have other rights spelled out herein or in the legislation of the Republic of Latvia and in the EU legislation. 6.1. The Buyer shall make payment for the Merchandise purchased when due and accept the Merchandise in the manner stipulated herein. Having chosen to pick the Merchandise up at one of the stores specified, the Buyer shall pick it up at the store of their choice within the period of time defined herein. 6.2. The Buyer shall keep the details of their login to Samsonite.lv confidential and not disclose them to any third person. Any responsibility for the consequences caused by any failure to keep login information safe shall be borne by the Buyer. 7.1. The Seller shall provide a possibility to use the services of the online shop, its terms of operation defined by the present Terms and Conditions and other terms and conditions established by Samsonite.lv. 7.2. The Seller shall deliver the Merchandise purchased by the Buyer to the specified address, in accordance with the present Terms and Conditions. 7.4. The Seller shall deliver and accept Merchandise ordered and returned by the Buyer on conditions outlined herein. 7.5. In the event of an emergency, when unforeseen circumstances are preventing the Seller from delivering Merchandise purchased from Samsonite.lv, the Seller shall offer to the Buyer analogous or comparable Merchandise. If the Buyer refuses to accept analogous or comparable Merchandise as offered by the Seller, the Seller shall, within 14 (fourteen) business days of the date of receipt of the Buyer’s refusal, make a refund to the Buyer if payment was made in advance, or otherwise cancel the order. 7.6. In the event of a return of Merchandise by the Buyer, the Seller shall refund to the Buyer the money paid for the Merchandise within 14 (fourteen) business days of the date of the return of the Merchandise by the Buyer. 8.1. Merchandise prices shall be shown at the Samsonite.lv online shop in euros, VAT included. The Buyer shall see the specific price of Merchandise to be paid once a basket is created. If the Buyer disagrees with the price shown, they shall discontinue the ordering procedure. 8.2. The Merchandise price is free of the deliver charge, which shall appear at the Shop and before the Buyer places an order. The exact delivery charge shall depend on the value of the order, and the location and method of the delivery. The Buyer shall pay the delivery charge unless the Shop explicitly states that the delivery is free. The Seller may offer free deliveries of orders that are in excess of a particular amount. 8.3. After the Seller has confirmed an order, the price of the Merchandise may not be changed unless it has changed as a result of a technical error in the information systems or for other objective reasons outside of the Seller’s control. In that case, if the Buyer refuses to buy the Merchandise at the new price, they may cancel the order before it has been confirmed. In the event of cancellation under this paragraph, the Buyer shall receive a refund of all of their moneys paid. 8.4.3. with a payment card. 8.5. Payment via online banking or with a payment card shall be made in advance and shall be handled by a payment system. With other methods of payment, the Buyer shall be directed to the payment operator’s website. Once there, the Buyer shall confirm the prepared transfer form and/or provide additional payment information. The login details for these websites and the information entered by the Buyer shall only be used for payment purposes and shall not be disclosed or forwarded to the Seller. After the payment is made, the Shop shall display the payment result for the Buyer to see. The payment shall be considered received as of the date when the money is credited to the Seller’s account. 9.1. The Seller shall have a right to cancel the Buyer’s order without notice in the event the Buyer chooses any of the payment methods listed under paragraph 8.4.1, 8.4.2, and 8.4.3 hereof and fails to make the payment within 2 (two) business days. 10.1. The Buyer shall have a right to pick the Merchandise up themselves or through a representative from one of the Seller’s stores House of Samsonite (the specific store where the order may be picked up shall be chosen from the list displayed at the time of placing the order), or choose the delivery service, in which case the Buyer shall provide the Seller with an accurate delivery address. 10.2. The Buyer shall pick the Merchandise up themselves or designate another recipient for the delivery purposes. 10.3. Merchandise may be delivered to the Buyer or another person designated by them by the Seller’s authorised representative. 10.4.1. The Buyer shall specify the accurate delivery venue. 10.4.2. The Buyer shall undertake to accept the Merchandise in person. The delivery shall be made against presentation of a valid ID (personal ID card, passport, or late-format driver’s licence). In the event the Buyer is unable to accept the Merchandise in person, and the Merchandise is delivered to the address specified by the Buyer, the Buyer shall not be able to make any claims towards the Seller regarding the Merchandise being handed over to the wrong person. 10.4.3. Pickup of the Merchandise ordered shall be made within 3 (three) business days of the date when the Seller notified the Buyer by phone and e-mail that the Merchandise is ready for pickup. If the Buyer fails to pick the Merchandise up within the designated period of time, the Merchandise shall be held for 30 (thirty) days with the Buyer due to pay an EUR 1 (one) charge for every day the Merchandise remains in custody. If the Buyer fails to pick the Merchandise up within 30 (thirty) days, the Seller shall terminate the Purchase and Sale Agreement and shall refund to the Buyer the Merchandise price paid. The Seller shall not be responsible for any losses that may result from the termination of the Purchase and Sale Agreement as described herein. 10.4.4. The Merchandise may only be picked up by the person placing the order or the person specified at the time of placing the order. The Merchandise shall be released against a valid ID (personal ID card, passport, or late-format driver’s licence). 10.5. The Seller shall reserve the right to change the delivery charge and the purchase order amount that qualifies for free delivery. 10.6. Merchandise shall be dispatched to the exact address of the Buyer or the person designated by them after payment has been received, and therefore the period of delivery shall commence as of the moment of receipt of payment for the Merchandise, unless circumstances covered by paragraph 5.4 hereof occur, in which case the delivery period shall commence on the date when the Buyer was contacted. 10.7. The Seller shall make every effort for the Merchandise purchased to be delivered as soon as possible. Not being able to deliver the Merchandise on the time specified in the order, the Seller shall contact the Buyer to negotiate a different time of delivery. 10.8. The Seller shall be released from responsibility for the non-compliance with the terms of delivery if the Merchandise was not delivered to the Buyer or delivered past due for reasons attributable to third persons or the Buyer. 10.9. Picking the Merchandise up or accepting at the specified location, the Buyer shall inspect the condition of the shipment and the Merchandise and sign a shipment handover document. Upon the Buyer signing the shipment handover document, the shipment shall be considered to have been handed over in proper condition and free from any defects (other than defects from workmanship) or inconsistencies in terms of kitting (that may be identified in an external inspection). Having noticed that the package of the Merchandise from the shipment has been damaged, the Buyer shall make a note of it in the shipment handover document. 10.10. If the Buyer fails to take the steps outlined in paragraph 10.9 hereof, the Seller shall be released from the responsibility towards the Buyer for any defects of the Merchandise other than defects from workmanship, as well as any inconsistencies in terms of kitting if such inconsistencies can be identified in an external inspection. 11.1. Merchandise purchased from Samsonite.lv may be returned and/or exchanged in line with the “Regulations Regarding Distance Contracts” approved the Cabinet of the Republic of Latvia and other applicable legal acts of Latvia. 11.2. To be able to return Merchandise of good quality, the Buyer shall notify the Seller in writing (by e-mail) to the effect and shall fill out a return form available here, to be included in the return shipment of the Merchandise sent by registered mail. 11.3. The Buyer may exercise the right to return unused Merchandise of good quality within 14 (fourteen) business days of the date of delivery by notifying the Seller in the manner stipulated in paragraph 11.2 above. 11.4.6. the refund on the Merchandise returned shall be made to the bank account designated by the Buyer in the manner stipulated in paragraph 7.6. 11.5. If the Buyer has purchased at Samsonite.lv a set of Merchandise kitted as a single item, they shall return to the Seller the entire set. 11.6. The Seller shall have a right to refuse to accept any Merchandise returned by the Buyer if the conditions of returning Merchandise have been disregarded. 12.1. The Buyer shall be fully responsible for the accuracy of the date provided in the registration form. If the Buyer provides inaccurate data in the registration form, the Seller shall not be responsible for the implications and shall have a right to demand compensation of any resultant losses from the Buyer. 12.2. The Buyer shall be fully responsible for their actions on the website while using Samsonite.lv. 12.3. The Buyer shall be responsible for the security and disclosure of their registration data to third persons. In the event a third person uses the Buyer’s registration data to log in to Samsonite.lv and to perform any further action (such as file an order), the Seller shall consider that third person the Buyer. 12.4. The Seller shall be released from any responsibility in any event of losses resulting from the Buyer failing to read the present Terms and Conditions against the Seller’s recommendations and in violation of their obligations, despite having been given the opportunity to do so. 12.5. Any direct damage and losses of the affected party shall be reimbursed by the party responsible. 12.6. The Seller shall not be responsible for any default under the Purchase and Sale Agreement and/or failure to deliver or delay in delivery attributable to third persons or circumstances that the Seller was unable to control or reasonably predict at the moment of entering into the Purchase and Sale Agreement, nor prevent their consequences (force majeure circumstance). If such circumstances endure for more than 1 (one) month, the parties may agree to terminate the Purchase and Sale Agreement. 13.1. The specifications of Merchandise shall be generally given in the description of each item of Merchandise. If the characteristics or specifications listed in the title of Merchandise differ from those given in its description, information presented in the title shall be considered to be the correct one. 13.2. The Seller shall not be responsible for any differences between the colour, shape, or other parameters of Merchandise shown at Samsonite.lv and those of actual Merchandise due to the specifics of the electronic devices used by the Buyer or other technical reasons, as well as considering possible differences in appearance that can be reasonable expected. 13.3. Unless the Shop and/or warranty cards indicate otherwise, Merchandise shall be covered by a general 2-year warranty for quality. A different warranty duration and other conditions shall be specified in Merchandise descriptions and warranty cards (slips) supplied with Merchandise. More information about available warranties and their conditions is available HERE. 13.4. The Seller shall not provide warranty service for the Merchandise to the Buyer. If a Merchandise item is subject to after-sales service, the Buyer shall be referred to a centre that provides that type of service. 14.1. The Seller may conduct various events and campaigns and alter their conditions or terminate such events and campaigns unilaterally at any time and without notice. 15.1. These Terms and Conditions were drafted on the basis of the legislation of the Republic of Latvia and the European Union. 15.2. Relationships arising out of these Terms and Conditions shall be governed by the law of the Republic of Latvia. 15.3. Any disputes regarding the enforcement of these Terms and Conditions shall be solved by way of negotiation. If the parties are unable to reach an agreement, the dispute shall be settled in the manner prescribed by the laws of the Republic of Latvia. 15.4. You may file a request and/or complaint regarding any Merchandise or service purchased from the Shop to the Latvian Consumer Rights Protection Center (Brivibas street 55, Riga, Latvia, LV-1010, Consumer helpline: 65452554, e-mail: ptac@ptac.gov.lv, website: http://www.ptac.gov.lv/, or to its regional branches) or you may fill out an application form in the electronic consumer dispute resolution platform at http://ec.europa.eu/odr/. All actions done with your personal data shall be based on the applicable provisions of the legislation of the European Union and the Republic of Latvia. 1.1. SIA Osterode online shop Samsonite.lv shall exercise care in protecting your privacy and personal user data following all Republic of Latvia laws. 1.2. In making purchases, the Buyer shall provide the Seller with their personal data necessary for the appropriate execution of the delivery: their full name, address (city/town, street, house number (no flat number will be required), ZIP code) for delivery purposes, a valid e-mail address and a phone number for contacting them over order confirmation (if necessary) and/or collection of details necessary to transact payment for the merchandise. In filling out a registration form to create an Account, registered Buyers shall enter in the Seller’s system a password to be used for subsequent logins to the Account created during their registration. 1.3. In handling and keeping the Buyer’s personal data, the Seller shall make every effort to ensure protection of the personal data from accidental or illegal destruction, modification, disclosure, as well as any unauthorised handling. Nonetheless, the Buyer shall also take care of the security and/or confidentiality of their data, especially for as much as it relates to data disclosure to third parties. Actions and/or confidentiality and security of data of underage persons shall be the responsibility of their parents or guardians. 1.4. The Buyer shall have a right to alter and/or update the information submitted in the registration form, as well as cancel their registration. The Buyer’s account will then be terminated, registration data deleted. 1.5. The Buyer shall have a right to access their personal data handled by the Seller and to know the method in which they are handled, and to demand correcting or destroying their personal data or suspending the handling thereof when the data are being handled in disregard of legal provisions, or to withhold consent to their personal data being handled. 1.8. By accepting the present Terms and Conditions, the Buyer shall agree that information announcements required for the purposes of confirmation of their orders, payments, and deliveries or otherwise for the execution of their orders be sent to their e-mail address. 1.9. The Seller shall ensure that Buyer Personal Data shall only be used for the purposes of selling merchandise. Subject to a separate consent, data provided by the Buyer shall be used for direct marketing purposes as well. 1.10. Buyer Personal Data collected by the Seller for direct marketing purposes shall be kept for 2 years or less from the last time of the Buyer logs in to their Account or performs an action (files an order, purchases Merchandise) at Samsonite.lv. 1.11. The Seller shall not store Buyer data relating to payment information. All payments shall be made via partner channels (Paysera.com, Venipak.lv). 1.12. The Seller shall not disclose the Buyer’s personal data to third persons other than the Seller’s partners offering delivery services or other services relating to the due execution of the Buyer’s order. In all other cases, Buyer personal data may only be disclosed in the manner prescribed by the legislation of the Republic of Latvia. 1.13. By accepting these rules, the Buyer shall also acknowledge their agreement to SIA Osterode handling Buyer personal data submitted by the Buyer themselves or collected by the Seller in the process of fulfilling the Agreement and releasing such data to its partners for the purposes of fulfilling the Agreement (making deliveries, ensuring payments, and so on) to the extent necessary to perform the appropriate functions. The Buyer shall be informed that the list of data recipients is prone to change. The Buyer shall be informed that they have a right to approach the Seller (the handler of persona data) asking to change the list of entities to whom their personal data have been released.